MINEXTAB® Floating is a valuable tool for active ingredient with narrow absorption window. This gastro-retentive delivery system (GRDDS) has is based on MINEXTAB® technology, with floating and swelling features in order to prolonged the gastric retention time. 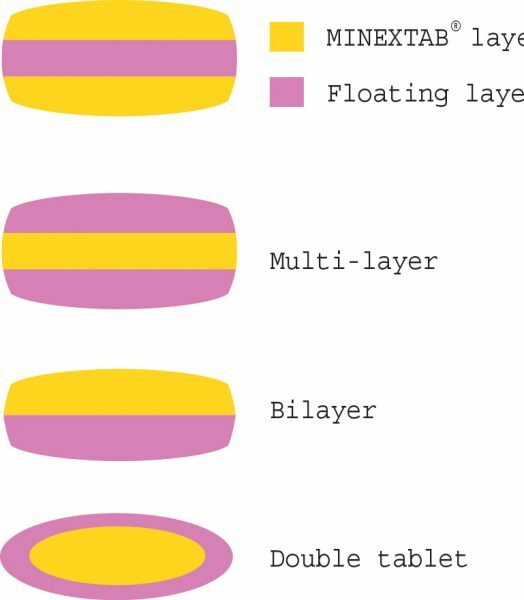 An active phase; using MINEXTAB® technology. An inactive phase, including mainly a gas generator and hydrophilic polymer or porous mineral to form a floating layer. The active and not active phases have a common surface or are separated with polymeric layer. Immediate release, modified release, bimodale release can be achieved. MINEXTAB® Floating uses conventional and scalable process manufacturing, well known in the pharmaceutical industry. All selected excipients included in MINEXTAB® Floating technology are described in the current Pharmacopoeae, an essential advantage for product approval.